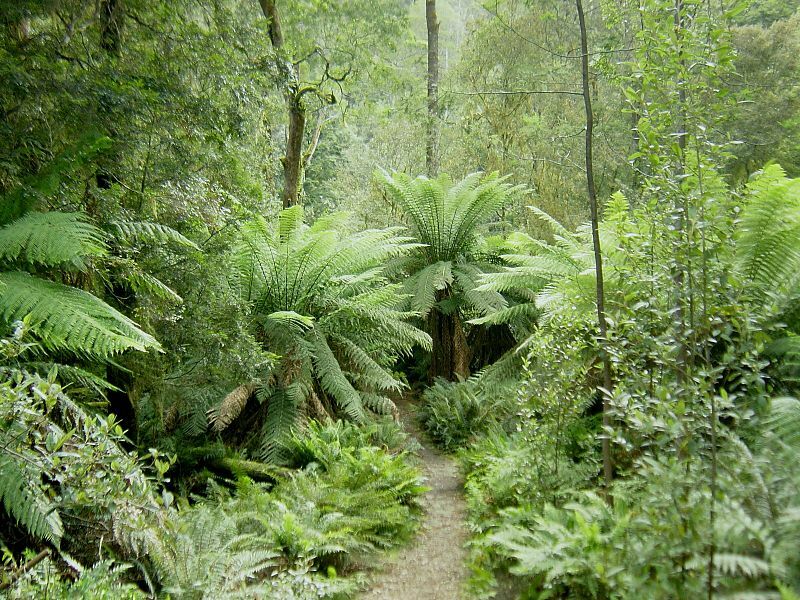 Make a list of the fruits and vegetables you eat a lot of, and grow those in a natural way that mimics nature… the forest. Small trees: apple, pear, plum, damson, cherry, almond, hazelnut. Berries: blueberry, blackberry, blackcurrant, goji, strawberry. Vegetables: carrot, parsnip, celery, onion, garlic, potato, tomato, sweet corn, broccoli, asparagus, runner bean, broad bean and pea. For conservatory or greenhouse: fig, lemon, olive, eggplant, sweet pepper, chilli pepper. Salads: lettuce mix, lamb’s lettuce, arugula. Herbs: rosemary, sage, coriander, basil, thyme, parsley, basil, chives, dill, oregano. 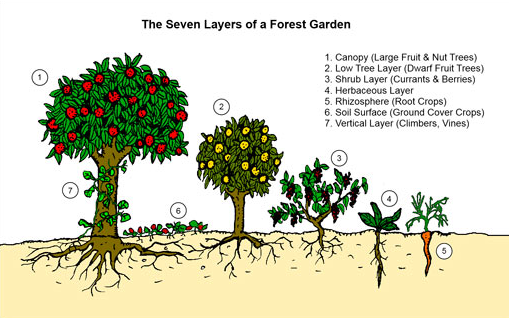 The forest shows us how to grow food optimally, by layering the plants… large trees, small trees, shrubs, herbaceous plants, roots, ground cover and climbers. So, we can layer and path our unused land in the same way to create largely self sustaining systems that produce food for us. If you have very little time for gardening, you could focus only on perennials, so that you get a truly self-maintaining but useful system, that’s also beautiful. Many of our commonly used foods have perennial equivalents… onions and brassicas spring to mind. And there are many perennial herb replacements too. Gardens like this are low maintenance need no inputs, and control insects and weeds by natural ecology — I feel the perfect solution to all the problems facing us in health, agriculture, climate change, pollution and so-on. It’s a true holistic solution. Let me know what you think and what plans you have for your garden! This entry was posted in Uncategorized and tagged Food, Garden, Genetically modified organism, India, Plant, Vandana Shiva, YouTube by Michael Kinnaird. Bookmark the permalink. 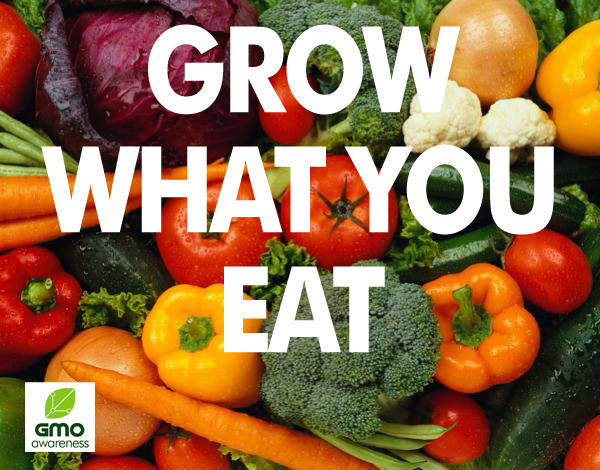 It’s a fabulous idea to think of the foods that you eat to figure out what you grow! Because we live in an apartment currently, we don’t have the space to grow fruits and nuts and everything else the we eat, but we grow what we can and everything else we buy locally! So far we are growing elderberries, garlic, snap peas, lavender, mint, oregano, squash, beets, radish, carrots, cucumbers, tomatoes, eggplant, peppers, and many flowers. We will be adding more once the weather warms up a little bit since a cold-front came in the night before last. It should start warming back up today. oooooo garlic, I forgot that! What do you use the lavender for? I love to make lavender lemonade! This year I hope we have enough so I can also start making lavender sachets from friends and family. Lavender is very calming to the nerves and can help with headaches, swelling, stress, etc. Are you growing all the things that you mentioned in the post? All the things you eat? That is A LOT to be growing and I would do just about anything to have a space big enough to grow using the permaculture food forest techniques!! We definitely do fit quite a lot into our small space, which is also shared with a few unruly landscaping bushes that I’m not entirely too fond of. That is totally magnificent, Michael! You are growing so much food! I dream of growing a forest of food one day, but until then I’m so happy to be growing on even a small space! It is such a blessing to be able to eat fresh food from my own home garden. I would love to see pictures of your food forest in progress! ooooo that’s an idea (pics). It could be a while before the “after” pics though, trees do take their sweet time growing :-) So it could be some years before it looks foresty.